The beloved tale of Peter Pan, created by author J.M. Barrie in a storybook, gets the Disney treatment here. Peter flies into the window of the Darling home, where three children - Wendy, Peter and John - are about to go to bed. 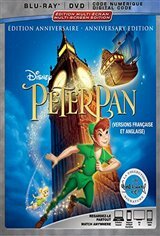 Peter and his fairy, Tinkerbell, convince the children to join him on a journey to the magical land of Neverland, where children never grow old. Along the way they meet Peter's nemesis, Captain Hook, as well as his right-hand man Mr. Smee, and a princess named Tiger Lily. This 65th anniversary edition comes with bonus features such as Stories from Walt's Office: Walt & Flight, which gives a peek into Disney's office, where he had many models and pictures of airplanes. Walt loved planes and was an aficionado of flying. A 'Darling' Conversation with Wendy & John: Kathryn Beaumont (voice of Wendy) and Paul Collins (voice of John) reunite for the first time in many years to reminisce and discuss their experiences working on Peter Pan, meeting Walt Disney and learning to fly ... literally. You Can Fly - A new rendition and graphic look of the classic Disney song, "You Can Fly," with lyrics on screen and lots of your favorite characters. Never Smile at a Crocodile - A new look at the deleted song, highlighting the relationship between Captain Hook and Tick- Tock the Crocodile... and more! The movie is based on the beloved novel by James M. Barrie.